The 3000 Word Leadership Lesson series consists of bite-sized stories that guide the reader through the various intricate aspects of Leadership and successfully maneuver through those intricacies. Each 3000 Word Leadership Lesson tackles current and real world situations that many organizations either don’t see occurring because day-to-day operations are moving at such a fast pace or management refuses to acknowledge such situations are actually happening. The 3000 Word Leadership Lesson Series is exclusively available for the AMAZON KINDLE DEVICES or APP. 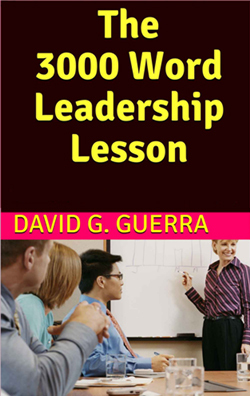 Each Leadership Lesson is just $0.99 USD. Doing the right thing even when it is in another department is still doing the right thing. In this lesson in leadership, an employee from a different department steps in when he walks upon a Customer Service situation that is spiraling out of control. Resolving the issue and saving the organization from a potential PR fiasco, all is not good. The adjunct Customer Service department manager crosses the line, the employee does not back down or give in to the demands of an untrained and ill-equipped manager. Sometimes doing what is right is exactly the change the entire organization needs. When an outsider is brought in to run a high profile department, he comes in already having friends in the department. Soon it is evident that favoritism has taken root and causing problems with the other employees of the PR department. Once the boss’ friends are promoted things quickly begin to spin out of control. Ultimately, the friends could not save themselves. Do you know who is driving your company vehicle? They might be your employees but are they driving your company into the ground? Is their reckless driving driving away your customers or potential customers? These are serious questions that unfortunately too many organizations overlook. They don’t pay attention until it is too late. In this story, the company while delivering a top notch product, fails to deliver top notch employees. This time someone is watching and the company is now out a multi-million dollar contract. Lynn Gonzalez is an administrative assistant to the consulting firm’s special projects coordinator. When a report on a Federal Grant is deleted from the company’s file server it falls on the Special Projects Coordinator to rebuild the report in time to meet its submission deadline. When the actual work is passed off to Lynn, the report is completed in record time. However, when it comes time to reap the rewards the boss is paid handsomely for all her hard work and Lynn is left answering the phones. The level of leadership in this lesson is one that will have you wondering why Lynn and her boss don’t exchange roles. Gerry Gonzalez is an IT consultant who has been asked to monitor the office activities while the Operations Manager, Kathleen (Kat), is attending an off-site training. When Gerry arrives he experiences something completely opposite than when Kat is in. Seizing the opportunity of having their boss out of the office, the staff takes liberties such as withholding customer service. Extended lunch hours and unanswered phone calls leave Gerry reeling from the complete 180 this office has taken while the “Kat’s” away. Upon returning the next day, Gerry briefs Kat on the previous days actions. The Operations Manager has to take action and does so to the point of surprising Gerry on his next visit. David Gordon is the new head of the bottling department. Six months earlier an unprecedented chain of events at the bottling department rocked the Ace Bottling Company to the core. When it was all said and done, while the company was still in business it needed changed to happen. While the corporate culture reeks of “that’s the way we’ve always done it” the leadership and management realizes that change, for the better, is the only way to make things better for the customers and most of all, for the remaining employees.